As you read that, I’ll bet you're not thinking about the historic French and Spanish roots that reach back before 1776. I’ll bet you are not thinking about one of the biggest shipping ports in the country. Come on, admit it. You’re thinking P-A-R-T-Y! Food and drink accompanied by colorful beads around the neck, and big brassy, sassy music blaring. What better place for a girlfriend’s getaway? Let’s head for the Vieux Carre (the old neighborhood — French Quarter) and see how many food and drink activities we can find. 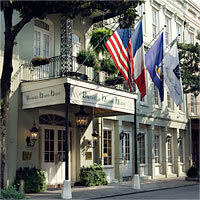 The Bienville House, 320 Decatur, provides the perfect resting place between forays out to see the town. The boutique hotel clusters rooms around a lush courtyard with a salt water pool. On the top floor, suites open on to a landscaped patio. Recently renovated, each of the 83 rooms has a different, classy, historic look. The location, in the French Quarter near the Mississippi River, puts you within walking distance of shopping, dining, and attractions in the French Quarter and along the mighty river. Start with lunch at Lily, the Bienville House restaurant. The award-winning chef serves up luscious goodies like a fava bean and lamb meatball soup or giant scallops served on Asian greens and slices of grapefruit. One amazing dish combines baby vegetables with gnocci topped with a to-die-for truffle sauce. Visit the Southern Food and Beverage Museum located on the 2nd floor of Riverwalk. This fun museum unveils the mysteries of gumbo, muffuletta, crawfish, jambalaya and more. Skip the Riverwalk Food Court and get the real Muffuletta at the Central Grocery Company, 923 Decatur, where they invented that glorious round sandwich, the muffuletta. Order a 1/4 — or a 1/2 if you dare — and feel like a real native of the Big Easy. Cross the street from Central Grocery, to get your Beignet fix at Cafe Du Monde — beware of falling powdered sugar — and sip some chicory coffee as you munch a little bit of heaven. Take a cooking class at the New Orleans School of Cooking where you choose a lecture style class or hands-on cooking. Take a walk through culinary history with a tour guide.